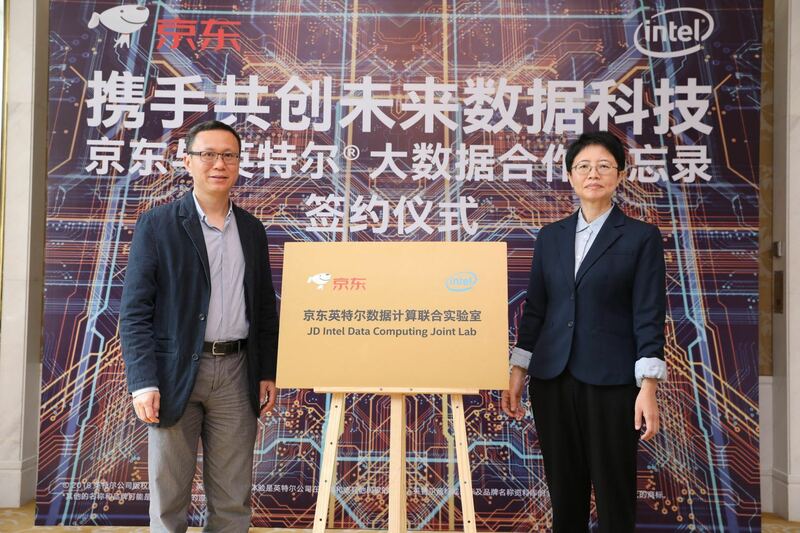 President of JD and General Manager of JD’s Big Data and Intelligent Supply Chain Group, Jian Pei (left), and Intel’s Ziya Ma (right), VP and Director of the Big Data Software Technologies, SSG announce the JD Intel Data Computing Joint Lab. This week in Beijing, Intel and JD celebrated their close partnership and collaboration during the JD Cloud Partner Summit with the inauguration of the new JD-Intel Data Computing joint lab. JD.com is one of the two largest online retailers in China, and increasingly a global brand, with over 313 million active users. In 2016, they expanded their services, to include JD Cloud—a cloud service providing enterprise users with infrastructure, platform, and software service offerings. The Big Data Cooperation Memorandum Signing Ceremony, pictured above, highlighted several newly launched collaborations between JD’s Big Data Group and Intel. JD built its technology stack on Intel® architecture from the beginning, and our success is based on these factors. Just about half of the CPU volume Intel ships to our cloud and digital service provider customers are custom products. Intel and JD collaborated on a custom version of the next-generation Intel® Xeon® Scalable processor to support JD’s unique JD Cloud and eCommerce workloads. Beyond the CPU, JD also incorporated other Intel innovations such as Intel® Optane™ DC SSDs, and plans to adopt our upcoming Intel® Optane™ DC Persistent Memory, a new class of storage technology offering the unprecedented combination of high-capacity, affordability, and persistence. These customizations provide significant performance gains on analytics and AI workloads, and help JD differentiate their cloud service offerings. JD joins over a dozen leading CSPs using custom CPUs from Intel. AI and Big Data workloads are key to personalizing the online shopping experience and improving supply chain efficiency. Intel® architecture allows JD to take advantage of the latest Big Data and AI workload optimizations. Intel also worked with JD closely to optimize their open-source software frameworks and toolkits, such as Apache Spark* on Kubernetes* and several others. According to Dennis Weng, Vice President of JD and GM of JD’s Big Data Group, "JD is building industry-leading big data architecture, balancing cost and performance with enhanced efficiency through a deep collaboration with Intel at both the hardware and software levels.” The result is a streamlined solution built on unified data analytics and AI pipelines. One example of this enhanced efficiency that we’re particularly proud of is a large-scale image search and extraction engine we developed together. You can learn more about this case use at software.intel.com. Many technology vendors supplying Cloud Service Providers like JD consider the job done after winning the design. Intel, on the other hand, is there to partner with our customers and help them grow their businesses using our technology. Intel offers joint marketing programs to help our cloud service provider partners grow demand for their Intel-based services. The JD Cloud Partner Summit is a great example of Intel sponsoring our CSP partner’s promotional activities to broaden JCloud’s ecosystem. For more information about how Intel can help you optimize your infrastructure and grow your cloud business, please visit http://www.intel.com/CSP. You can also join Intel’s Cloud Insider Program gaining exclusive access to the latest cloud technology, marketing tools and educational resources. Chloe Jian Ma is the Senior Director for Cloud Service Provider Marketing at Intel. 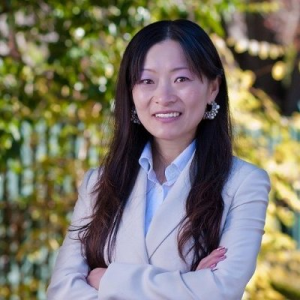 Previously she led SDN solution marketing at Juniper Networks and before that was responsible for enterprise solutions marketing at Huawei Enterprise covering a range of Networking, Security, Storage and Unified Communications products and solutions. Her technical background spans networking, telecom and enterprise hardware, and software. She holds an MBA in Marketing and Strategy from University of Pennsylvania - The Wharton School, an MSEE from the University of Southern California, and a BS, Electronics from Peking University, Beijing, China.